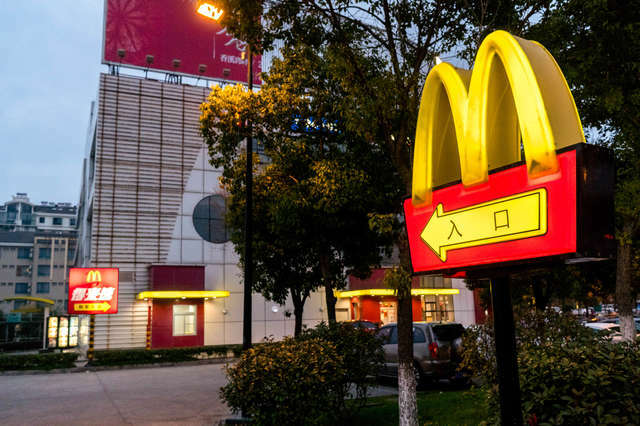 McDonald's recently announced the inclusion of international items at a South Florida location, as they've done previously at their worldwide headquarters in Chicago. Those of discerning tastes have always known food from the Golden Arches outside US borders is often more interesting and… uh, well, better. So, this would appear to be a positive. But when you see the menu, you'll note their slate of global samples is a little lacking in true, multinational panache. Stroopwafel McFlurry is a nice (albeit sticky) stab at betraying the greatness of Micky D's worldwide front (bedankt you, Holland). But where are the fried chunks of Camembert? The chicken and spaghetti? Where are the durians, damn it?! Here are the international menu items I truly believe should be considered for any upcoming shots at domestic expansion. Dishes so tantalizing, I'd be willing to sell off the state of Florida, just to acquire them. Perhaps the only way to convince mainstream America to try a durian, is to bury it deep, deep in McFlurry. Let's get right to the durians here: Singapore has turned the (surprisingly controversial) fruit into a McFlurry flavor. Durians are a hard sell to most Americans -- but in this format, the cultural blow should be softened, allowing Joe Schmoe van/choc/straw enthusiasts the ability to consume durians in a safe space. We want the Durian McFlurry. When you choose to go to any fast food outlet, you're already waiving some of your rights to be concerned about overconsumption. These fried bites of Camembert cheese are indeed artery-threatening -- but why not go all in with your Micky D's dessert? Germans just understand the art of excess, and this will get your ticker beating harder than a cruise down the Autobahn. This wouldn't necessarily rank as an "exotic" food item for Americans. In fact, they could have called it an "America Box" and no one would question the decision: You're looking at six chicken wings, six chili cheese-stuffed tots, and six chicken wings. And it comes in a little, Happy Meal-esque box. Finland is already one of the safest, happiest, and least insecure countries in the entire world. If anyone needed this, it's definitely Finland. The beef-less Big Mac of India was almost called "The Aristocrat," (which you likely know, because you read McDonaldsBlog.in) and it was a "complicated sandwich," according to a Vikram Ogle, the Director of Q.A. for McDonald's India. The two chicken patties of the Maharaj mac are joined by L.T.O, Cheddar cheese, fiery jalapenos, and habanero sauce. It's basically the desi Big Mac. I would like to pair it with a fountain soda. A few countries in Europe and Southeast Asia have been offered the divine grace of witnessing the combination of arguably the finest form of fry (curly) and almost definitely the best fast food fry (McDonald's). For some reason, McDonald's has reasoned we don't deserve it. I would never eat a McMuffin again. McPasta failed in Italy for the same reasons McMerlot would hypothetically fail in Burgundy. But in the Philippines, red sauce and pasta is kind of like an international novelty for them, like budget chicken parm. For us, it's like seeing a familiar American(ish) dish in a Filipino, fast-food funhouse mirror. To be honest, I just think it would be fun to say "McChocolate Potatoes" out loud. I'm actually not sure why there is no fast-food shrimp in America, in general. It's kind of hard to get wrong, and it could easily hold its own in a lineup of deep-fried, drive-through mainstays. Perhaps it's a Putin power play. I'd like to see how this plays out. The Japanese equivalent of the McRib -- because of a cult-like following and limited release time, not composition -- the Golden Tsukimi line of sandwiches (breakfast, chicken, and burger) is named after the traditional Japanese harvest moon festival, featuring delightful looking, puffy golden buns, eggs, and a thick layer of bright yellow cheese. I would grit my way through a Japanese gameshow, if only for one golden, magic bite. Singapore has three entries on this list -- and I just have to say, I think they have the most nuanced, interesting McDonald's menu out of any country in the world. Which... I mean, is something at least? The Hokkiado Salmon Burger is probably the most extreme departure from American McDonald's standard menu, but this panko-breaded patty with roasted sesame mayo and shredded cabbage actually looks pretty good. It really makes you wonder -- again -- why fast-food seafood isn't a bigger part of the business, at least in the States. Though they don't always come in real glasses (Vincent Vegs spins in grave), McBeer would certainly pair well with McJust about anything on any McDonald's menu and it just makes sense and how hasn't this happened yet?